At our practice, you’ll experience comprehensive care provided by a skilled staff in an office that feels like a friend’s living room. Sounds pretty nice, right? We’re not all about our bottom line here—we’re about using the least amount of treatment possible so you can spend less time in the chair and more time enjoying your smile! Dr. Cowell’s approach to dentistry is all about using a light touch. Our relaxed yet effective approach will change the way you think about going to the dentist, and we’ll make you wonder why you ever went anywhere else. Our team will treat your time like it’s our very own. Everyone is busy these days, so no one needs to waste time waiting for an appointment they booked weeks ago. In our office, we are extra diligent about seeing our patients exactly when they are scheduled. If we’re even 5 minutes behind, Dr. Cowell himself will come into the waiting room, apologize, and explain the situation. Basically, our goal is to provide the kind of care that always works with YOUR schedule. Rather than try to give every patient a fluorescent Hollywood-style smile, our goal is to simply get our patient’s oral health to a stable and manageable state. We just want to give you exactly what you need to be able to eat, speak, and smile with ease and nothing more. Should you require a more extensive treatment, we’ll be sure to explain why in great detail, and you’ll be the one who decides to proceed, not us. We strive to form a partnership with all of our patients rather than just tell them what they need and how we’re going to give it to them. Different people have different needs and wants, and this is always taken into account when we formulate a treatment plan. We’ll make sure you know exactly why we’re recommending certain treatments so that your dental care always comes with peace of mind. If you have a question, ask it, and we’ll take all the time we need to give you a satisfying answer. 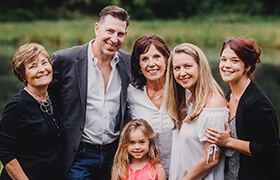 Dr. Cowell and our entire team have years of experience treating patients of all ages, so whether your child is getting their first teeth or you’re interested in upgrading your dentures, you and all of your loved ones are always welcome to our practice. We have the fun, welcoming approach that kids love as well as the specialized services that adults need. With us, we’ll make sure your entire family tree is filled with gorgeous, healthy smiles! We like to say that our team is small but mighty! Their number one goal every day is to put a smile on our patients’ faces and make sure they have everything they need to enjoy their appointments. Every one of our team members has decades of experience in the dental field, so they know exactly how to put even the most nervous patient at ease. Once you get to meet them, we’re sure you’ll miss them between appointments! Almost every patient who comes through our doors has gone through a dental practice where the doctor and staff tried to sell them on a procedure they really didn’t need or want. That couldn’t be further from how we do things! To us, less is more, and we’ll only recommend the treatments you absolutely need. We’ll never put pressure on you to get anything you don’t want. We want to form a long and trusting relationship with you and your family, and that certainly won’t happen if you feel like we’re just trying to squeeze money out of you! With us, you’ll always feel like we’re on your side.